This close-up drawing of the LET shows the ultrathin silicon junction acting as a quantum well. After recombination, the electric carriers are confined into a standing wave, greatly increasing the electroluminescence efficiency. Credit: Shin-ichi Saito, et al. In one of the early discoveries of the current "silicon electrophotonics era," scientists from Hitachi, Ltd. in Tokyo have built a light-emitting transistor (LET) that transfers, detects and controls an electrical signal all on a single nanometer-sized chip. 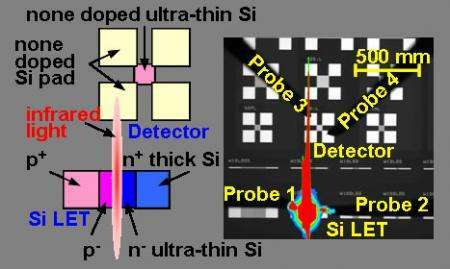 Using a silicon-on-insulator (SOI) substrate, the group could optically connect the LET to a detector, resulting in a tiny chip that may integrate a wide range of microelectronics and photonics nano devices. Similar to a standard field-effect transistor, Saito et al. 's LET takes advantage of some interesting properties of 2D electron and electron hole systems, called “quantum confinement effects.” By reducing the thickness of the crystal silicon down to the nanometer scale, the scientists fabricated an ultra-thin single crystal silicon film, directly connected to the thick silicon electrodes. In such a design, n-type (electrons) and p-type (holes) semiconductors lie next to each other separated by a narrow junction. As the electrons and holes efficiently eliminate each other in a process called "recombination," photons are emitted; thus electrical signals can be converted to optical signals. At left, the drawing of the LET describes the scientists’ observation, shown in the electroluminescence intensity map at right. The infrared light emitted from the LET reaches the detector, meaning that an electrical signal can be transferred to the detector by light. Credit: Shin-ichi Saito, et al. In this set-up, the p-n junction consists of a light-emitting diode (LED) made of ultrathin silicon. At a 9nm thickness, the silicon acts as a quantum well, confining the electric carriers to two dimensions, which forms a standing wave consisting of an electron. This confinement serves an especially useful purpose for integrating optical components into silicon circuits, as it enhances the electroluminescence efficiency of the junction. While other LETs--from carbon nanotubes and organic models to semiconductor and nanocrystal devices--have been demonstrated, Saito et al. 's is the first in which recombination occurs along the silicon junction and takes advantage of quantum confinement's electroluminescence. To optically interconnect this electrical signal from the LET to a detector--which were electrically isolated but on the same silicon chip--the group applied a forward voltage bias to the LET. The scientists observed the light from the LET to reach the photodetector, and measured the "photocurrent" in the detector to increase with a voltage increase, and decrease when the voltage was turned off (detector limitations caused some current to continue flowing). Although the Hitachi group points out limitations to the present experimental set-up that need to be fixed before applying the principle to marketable technology, they suggest solutions for these problems: for example, reducing the response time of the detector and using waveguides to contain the light on the chip. However, the achievement shows how, using curious phenomena of quantum mechanics, photons, just like electrons, can be manipulated on a silicon chip. Quite possibly, future integrated circuits may use lights instead of currents to enhance performance while reducing power dissipation. Citation: Saito, Shin-ichi, Hisamoto, Digh, Shimizu, Haruka, Hamamura, Hirotaka, Tsuchiya, Ryuta, Matsui, Yuichi, Mine, Toshiyuki, Arai, Tadashi, Sugii, Nobuyuki, Torii, Kazuyoshi, Kimura, Shin'ichiro, and Onai, Takahiro. "Silicon light-emitting transistor for on-chip optical interconnection." Applied Physics Letters 89, 163504 (2006).